An interesting type of Ghosting was just observed with this new clock design. Usually ghosting is caused by timing, due to the lag time of the display, or due to stray voltages ionizing the tubes. These have been addressed by adding inter-digit blanking periods, and mid-pull resistors. 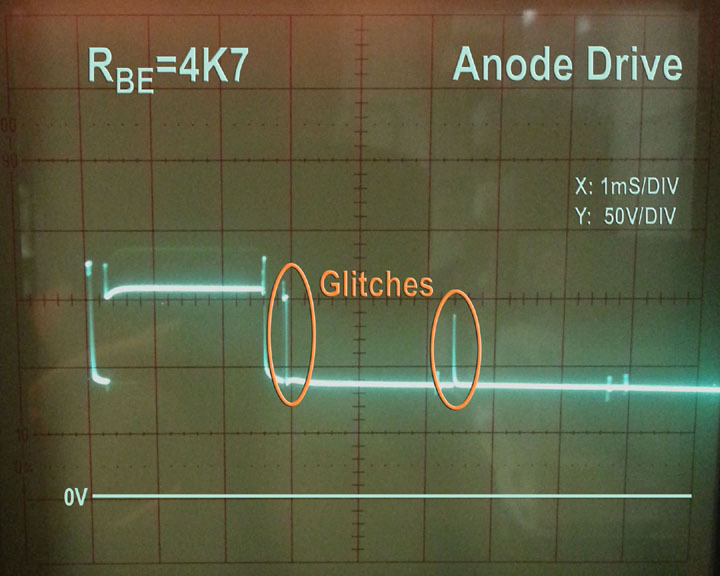 Notice the two large glitches out on the anode signal, that’s tied directly to the nixie. This signal starts at the NPN (2N6517), that’s in turn driving the PNP (MPSA92). 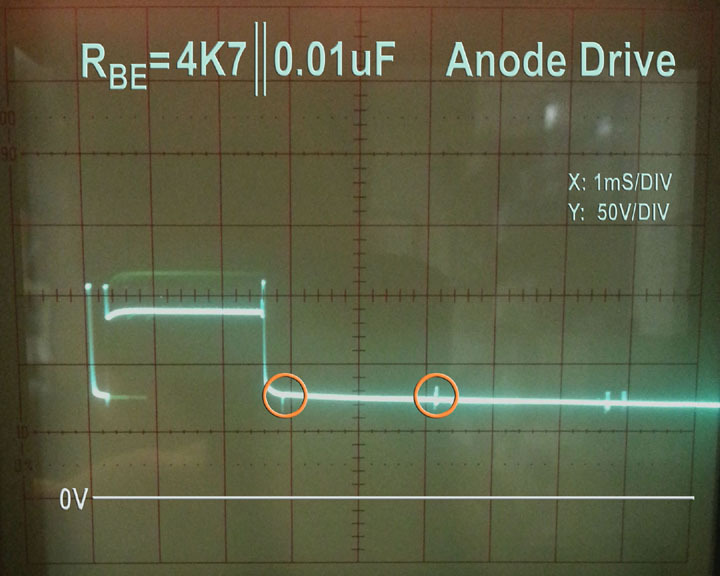 Also notice when Off, the anode goes to ~100V, the mid-pull value, not zero (the line all the way at the bottom). When its intended to be ON, its ~150V, which is the maintaining level. Only at the beginning is it at ~200V. Figure (a) shows the original circuit. The glitches are timing and impedance related, and to the way “Q11” is driven. Remember, its charlie-plexed, so both base and emitter are shifted, either HIGH, LOW, or to a High-Impedance state. The ST devices have been found to have a hfe of only 24, while the 2N6517, has one exceeding 150. This makes the 2N6517 more susceptible to these transients. But two simple fixes, allow us to use any device. One (b) just reduces the signal level that get to the PNP, by making the divider ratio larger ([R4+R3]/R3). The other (c) suppresses the transient, due to its short time. That means it can be filtered out by a simple RC network. 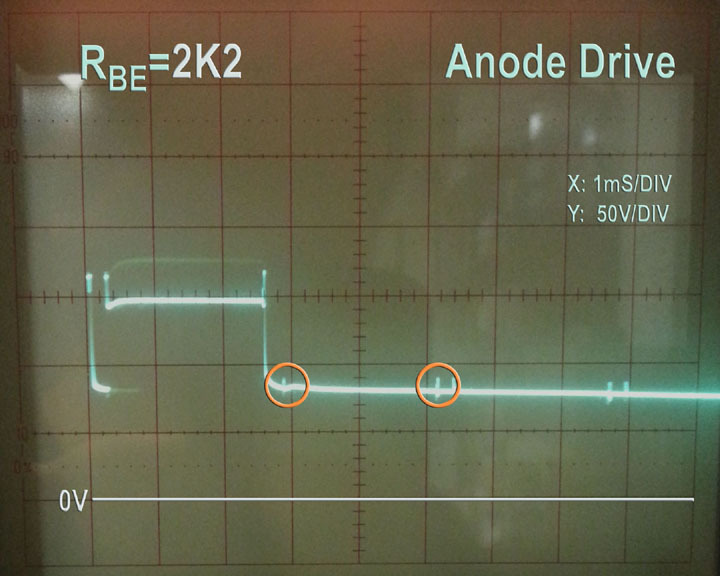 In short, changing the base resisitor (R3) to 2.2K, or adding a parallel 0.01uf cap (Cx), solves the problem. using a simple RC signal, to kill the spikes. This board uses method “C”, above, to inhibit “ghosting”. 6 0.01 caps have been added across the BE junctions of the HV PNP anode drivers, to suppress any spikes. These spikes are due to higher gain HV NPN transistors used to drive the PNP’s. Now any HV NPN can be used at these locations. Improper timing is a common cause for ghosting, but that can be corrected by software adjustments. The timing on this board, includes adequate blanking intervals to allow the nixies to transition without ghosting. Also Base-Emitter resistors are added to the anode transistors, to ensure that those transistors switch OFF promptly. Damaged uC I/O: The I/O bits driving the anode and cathode transistors are sometimes damaged. Each uC is fully functionally tested before being kitted. My parts handling area is also equipped with anti-static measures. However, static damage does occur. Most hobbyist do not have anti-static handling stations, and Atmel parts do seem to be a tad more prone to static damage, than their competitors. The symptoms are pronounced. Not just a hint, of another digit being ON, but two, or more numerals, of equal brightness present at the same time. Improperly installed components: Its very important to make sure, that the proper component is installed in the proper location, in the proper orientation. This seems like a big “duh” !, but it happens. I do it, myself. Sometimes you spend too much time working on something. Its time to take a break, and play with the kids, to get some fresh eyes on the problem later. And then the munchkins says, “granpa, why is the white paint facing left, and the black part facing right ?”. Doh ! Flux Residue – inadvertent conduction paths: Keep it Clean ! The nixies are driven here, using a unique form of multiplexing, called Charlieplexing. A key for it to work, is that only two I/O bits are in a low impedance state, at any time. One outputting a a one (1), and the other a zero (0). All other I/O bits, in that matrix, are to be in their high impedance state. Its very important that those inhibited I/O bits conduct absolutely no current. If they do, then unintentional transistors will be turned ON. This can happen if conductive material gets trapped in the flux residue. This residue absorbs, and holds water. That water, in combination with other contaminants will conduct. This usually isn’t an issue with most modern circuits. It is, however, when employing charlieplexing. They now sell no-clean fluxes. Clean it off, regardless !